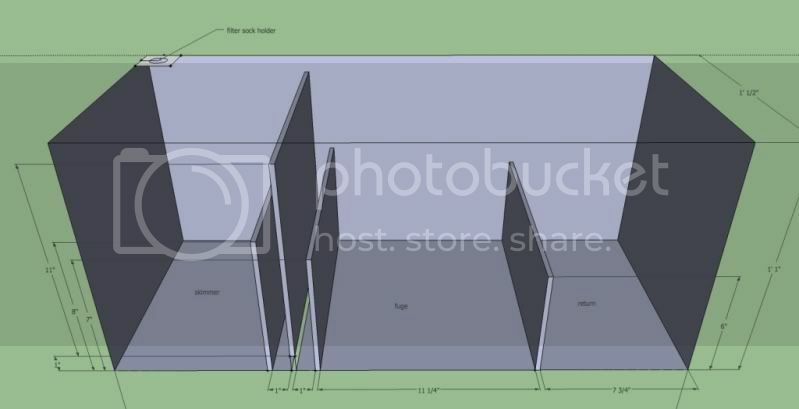 I am planning a new build and my sump does not have room for a refugium. I am looking for creative ideas on how I can plumb one externally that will be fed by my return pump and will dump into my existing sump. The external sump will be a 15 gallon rimless. Could anyone point me to a link where I can see some pics oF how others have done something like this? I don't have a pic, but i ran a fuge above my frag tank. It was a 20L with a DSB, probably 3inches deep across with a couple of different flavors of algae. I only fed the fuge and the fuge would constantly feed the frag tank. I think that was the healthiest my tank has ever been. Long story short, I broke the fuge in a move and never replaced it. But gravity feeding your display all day long works great. I am thinking of placing it next to my tank but most likely it will be in the stand next to the sump. Looking to see how others have set up something similar. I actually just set up my fuge/sump today. I haven't plumed it in yet, I'm going to wait a few weeks. Basically its a simple set up, from tank gravity feed to filter sock which is in the skimmer section, a few baffles, then a 5" DSB/fuge, into a return section. I'll take some pics tomorrow. All glass panels in the tank are 2 in taller in mine so I could handle more water. My return will have a shut off valve to stop back flow during a WC. Nice design. That is what I wanted. 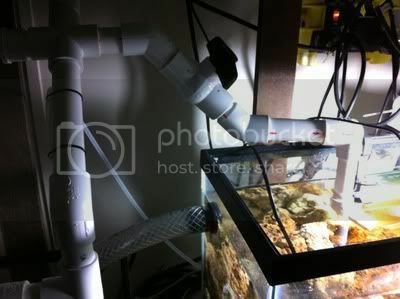 Want to plumb in a refugium which will be a separate tank from the sump. Any advice/ pics? I ran into the same issue when I up graded my skimmer a couple years ago and had to pull my baffles between my skimmer section and fuge, I simply added a second tank to the stand next to the sump. It's easy to do just elevate the new fuge tank so it is above the sump enough to clear a bulk head fitting (only the bulkhead needs to clear the sump not the whole fuge tank), then feed the fuge from a T in your return pump problem solved any you can control the flow to the new fuge with a ball or gate valve. My ghetto fuge worked great. I put a bucket on top of the 15 gal sump. Used a small pump to pump into it and put a hole where I wanted the top water line. Shoved a hose in snugly as the drain so I did not have to listen to the water trickle down. Used a small powerhead for circulation and a clip light. I think the bucket was about 2 gallons, and I used eggcrate and PVC to support it. The chaeto "swirled" slowly promoting rapid growth and nutrient export. It worked amazingly well, and I had rapid growth while my small tank was overstocked. Put as large a bulkhead as possible on the fuge. Water flowing out of the fuge won't be under pressure and with a small bulkhead you're very limited in the amount of flow through the fuge. Check out life reef. They make a stand alone fuge. I have one and it's great. Yup best way is DT tank drain tee off 80% sump 20% goes into fuge. Have the fuge elevated alittle so it gravity feeds to the return section. This way u avoid use a pump also. How big would you suggest the drain be from the fuge to the sump? 1 inch or 3/4 or 1/2? Before you do any thing, do yourself a favor and read http://www.reefcentral.com/forums/sh...d.php?t=969713 front to back, this is the way to go!!!!!!!!!!! Going to Church does not make you Righteous any more than standing in a garage makes you a car! Sarchasm: The gulf between the author of sarcastic wit and the person who doesn't get it! Current Tank Info: 210g Miracles "Starphire" In-Wall, 340g total system, RO Skimmer, Maxspect Razor LED's, Mixed Reef. It looks like they reinvented the bioball with eggcrate. $35-50 for a <1" frag of some stupid named thing that came from a colony you bought for $40-60 wholesale and chopped into 20-40 pieces? No thanks. 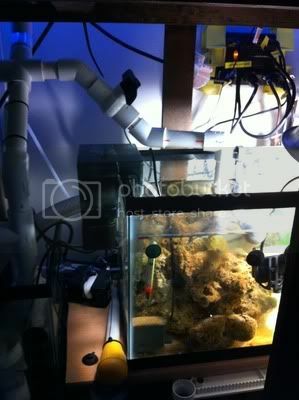 "JasonH"
Current Tank Info: 125 aggressive reef, DIY led lighting, swc cone skimmer, 33 gallon sump, posiden Ps3 return. My sump is in an adjacent separate room from my tank. Eheim 1262 pump return plumbed into a manifold whereby majority of flow returns into the tank. Some flow goes through hose into a 70 gallon rubbermaid stock tank and gravity feeds back into return section of sump via bulkhead installed toward upper part of stock tank. Sump and stock tank are on floor, manifold installed into wall above both. sent from my laptop while sitting on the couch! With a refugium that gravity drains into the sump, the drain line needs to be fairly high up so that the refugium doesn't drain dry when there's a power outage. With this setup, do you still get pods migrating into the sump and then the DT? Yes, they can make it. I set up my fuge exactly how Poeticlydead describes above. The good thing about using the return pump to the fuge instead of the DT drain is that the DT drain will be having detritus, which you don't really want going into the fuge unless you have a clean up crew in there. If you use the return pump instead, that water has mostly gone through the skimmer to remove the nasties that you don't want settling in your fuge. Have your fuge drain back into the sump close to your return pump so that the water from the fuge will go straight to the DT without being skimmed again, losing any pods. Put valves (ball or gate) on both the DT and fuge side of the return pump so you can control both. The fuge is going to be closed a lot more than the DT because you don't want a ton of flow going through there. I have yet to find a disadvantage of this design. 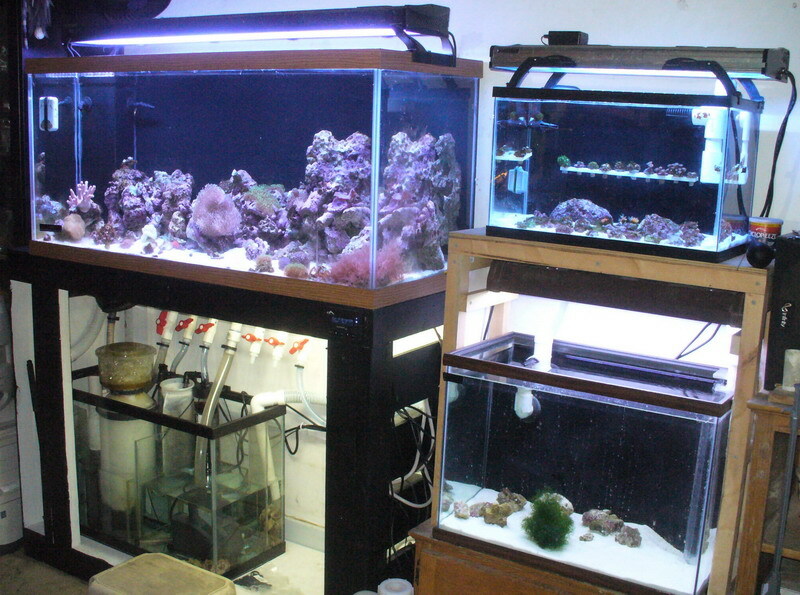 My fuge is mainly for pod cultivation to feed my dragonet and corals. I keep a ball of chaeto in a dedicated area of my sump for filtration. Tank water goes through this, then the skimmer, then into the return pump manifold. So i get "clean" water into my display fuge. I get virtually no detritus buildup in the fuge this way. What little that does make it in there is easily consumed by the fauna that live in there. Thereby feeding them and completing the cycle of things. And by the fuge gravity feeding into the display i have more success in getting live pods of all sizes into my display tank without them getting chopped up by a pump impeler. So far it has worked out great. I have two pod depended fishes in my tank that are so fat they look as if they are going to pop!